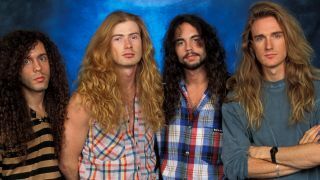 Former Megadeth drummer Nick Menza has stopped short of confirming or denying whether he’s returning to the band. Speculation has been rife in recent weeks that the sticksman, who left in 1998 after a five-album stint in Dave Mustaine’s outfit, could be set to come back after the departures of Shawn Drover and Chris Broderick in November. Megadeth last month released a teaser video showing bassist David Ellefson playing in their studio with an unidentified drummer. He and Menza attended the NAMM industry show in California at the weekend. Megadeth intend to record their 15th album as planned this year. Former guitarist Glen Drover recently predicted Menza would be part of the project. Last month Mustaine recently promised fans “would be very happy” with the upcoming lineup announcement.